IHEA seminars offer classroom instruction for those in the thermprocess industry. 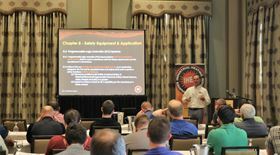 The Industrial Heating Equipment Association (IHEA) has announced the dates for its 2019 Fall Seminars and Fall Business Conference. The events will take place in Cleveland, Ohio, from 24-26 September. The technical seminar series will be held on Tuesday and Wednesday, followed by the IHEA Fall Business Conference on Thursday. The organization’s 50th Combustion Seminar and the Safety Standards and Codes Seminar will take place concurrently over both days and there will also be two separate one-day seminars on infrared heating and induction technology, the IHEA says. Attendees of all four seminars will also be able to access IHEA’s Tabletop Exhibition & Reception. This story uses material from the IHEA, with editorial changes made by Materials Today. The views expressed in this article do not necessarily represent those of Elsevier. The Industrial Heating Equipment Association (IHEA) has announced its 2016-2017 board of directors and executive officers. The IHEA’s fundamentals of industrial process heating online learning course is scheduled to begin on 17 October 2016.